Girl in Translation by Jean Kwok, narrated by Grayce Wey. Grades 9+ [adult, with high crossover appeal]. Riverhead [a division of Penguin Group], April 2010. 293 pages, 9 hours on 8 discs. Audiobook provided by my local library. Chang Ah-Kim immigrated to the United States from Hong Kong, becoming Kimberly Chang, when she was 12 years old. And suddenly everything was different. Instead of a nice house, she and her mother live in a tiny, bug-infested apartment with no heat. Instead of working as a music teacher, her mother works in a clothing factory, slaving away for as little as one or two dollars an hour. And, perhaps most devastating to Kimberly, instead of being one of the top students in her class, Kimberly is failing her classes because she doesn't speak English and her teacher won't take the time to try and understand her. But Kimberly is strong, brave, and so smart that she's a certifiable genius. And this is the story of how she overcame all the obstacles in her path and navigated all life's twists and turns to pull herself and her mother out of crushing poverty. This is a novel that grabbed me and wouldn't let go. Even now, weeks after finishing it, I'm still raving about it to anyone who will listen! The fact that it's loosely based on author Jean Kwok's own childhood makes it all the more riveting. As I was listening to the story, I felt like Kimberly was sitting across from me and telling me everything that had happened to her. Kimberly's voice instantly drew me in to the story and I cared about her like I actually knew her. I was rooting for her the entire time. Some of the descriptions of the poverty Kimberly and her mother endured were hard to listen to, but they still exist today. How could the school expect Kimberly to get her projects done when 1) she didn't speak English, 2) she had to help her mother work in the factory for hours after school every day, 3) when she finally did get home their apartment was unheated and crawling with bugs, and 4) there was no money to spare for fancy supplies like markers, poster board, or magazines to cut up. This is certainly an eye-opening story that may inspire empathy towards immigrants and those living in poverty. As I listened, Grayce Wey's narration grew on me and I appreciate the subtle changes in voice that she used when reading different characters. It was enough of a change for me to keep the characters straight and not a lot else, which let the fine writing shine through. This is one of those books that had me looking forward to the commute because I needed to know what happened next. This was Jean Kwok's debut novel and you can bet I'll be looking forward to more from her. I am a huge fan of Amy Tan and I'd quickly hand this book to other Amy Tan fans. The coming-of-age in New York aspect also reminded me of another favorite from my teen years - A Tree Grows in Brooklyn by Betty Smith. I'd also recommend it to teens and adults interested in books about the immigrant experience, like maybe Uprising by Margaret Peterson Haddix or Interpreter of Maladies by Jhumpa Lahiri. 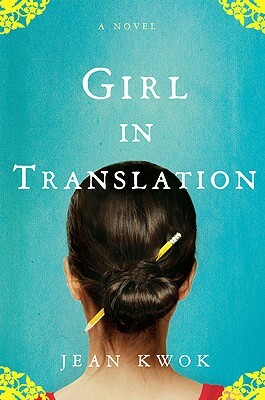 Girl in Translation was a 2011 Alex Award winner. Check out more reviews at Book Nut, GreenBean TeenQueen and A Patchwork of Books. Girl in Translation is on shelves now!